Binge drinking usually conjures up images of young people stumbling out of bars in a hazy mess however the reality is that just having two large glasses of wine will categorise you as a ‘binge drinker’. My Liver Exam gives you here more details. This is not an exact definition of binge drinking, as tolerance to alcohol can vary from person to person and the speed of drinking in a session can also alter alcohol’s effects. 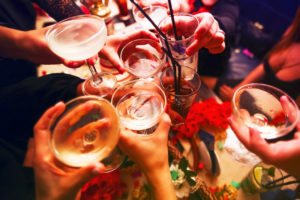 While the social effects of binge drinking are widely reported, the impact that it can have on health is usually a less popular subject. Aside from the sluggish, hangover feeling that you get when you drink too much, alcohol can cause serious damage to your body. Regular sessions of drinking over the limits can have a very real impact on health and alcohol is now considered a causal factor in more than 60 medical conditions, including: mouth, throat, stomach, liver and breast cancers; high blood pressure, cirrhosis of the liver; and depression2. If you are worried about your alcohol consumption or the health of your liver, visit your GP. Why is excessive alcohol bad for your liver?